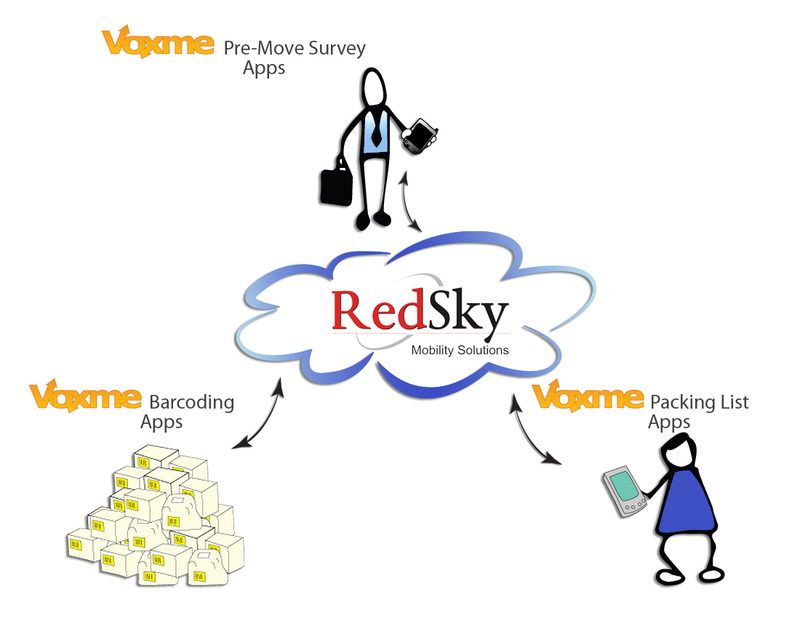 RedSky Mobility Solutions, LLC has selected Voxme Software Inc. to provide integrated mobile pre-move survey estimation, digital inventory list and digital warehouse inventory management solutions to its users. RedSky Mobility Solutions operates RedSky, a hosted, browser based relocation management system developed exclusively for the UniGroup UTS network. Voxme Software provides pre-move surveys, packing inventory, labeling and barcoding applications to removals and fine arts transports industries. "Many of our customers have benefited from the accuracy, efficiency and sales advantages that our mobile solutions deliver. What excites us about our partnership with RedSky is that few companies are exploring the application of this technology within a globally connected network operating under one common relocation management platform. Producing a digital inventory list is great, barcoded labels are cute, but without a connected company at destination to complete the loop by receiving the digital inventory and checking off the barcodes, the system is not quite complete. These ideas are not new, but RedSky platform has the inventory sharing built-in, which allows the agents within the network to take full advantage of our solutions. RedSky Mobility is moving at a pace that is not always associated with the moving and we are excited to share the common goal of transparent digital inventory sharing with Ray and his team." Ray daSilva, President of RedSky Mobility Solutions reports that the Secor Group has integrated the Voxme Survey system into their business. "Using iPad tablets, moving consultants are now able to receive survey appointment details wirelessly regardless of their location. The digital survey information, including photos of special articles, access, material requirements are transmitted to RedSky for use in formatting proposal forms and transmitting instructions to operations. This digital survey inventory is also made available to the customer in RedSky’s customer portal. Customers can interact with that survey inventory to add or delete items and even use it as an aid in preparing insurance valuations. The tablets work nicely because the consultant can display images of packing sequences, examples of documentation. Best of all, the tablet can connect to the internet through a cellular or wireless signal to access RedSky directly. If the customer wants to add a phone number or make some change during the survey, it happens on the spot." RedSky is working closely with the Voerman Group and Secor in developing the integration for the digital inventory and warehousing applications. Edwin van der Vliet, Operations Manager of Voerman in The Hague, sees the advantages of the integrated solutions for his company. "We run a high volume, high turnover operation. The ability to barcode individual items, pallets, storage vaults and containers to dynamically record and report locations to RedSky will reduce errors and improve our efficiency." Click here for the full version of this press release.